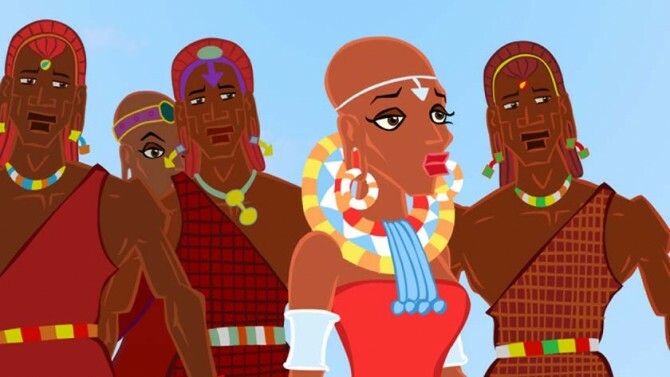 Executive producers: Wallace Murungi, Alnavaz Amlani ; animation, Ian Kiogora, Alfred Muchillwa, Ray Gicheru, Sendeu Kanyare, Alan Mwaniki ; 3D animation, Wambugu Kaigwa, Laibuta Kimathi ; original music score, Jim Pywell ; sound design, Kevin Safari and Satellite Sound. “The Legend of Ngong Hills” is a creation myth of the mountain range that backdrops Nairobi, Kenya. This film touches upon greed, desire, notions of territory and women as instruments of power for men. The green ogre steals livestock from Maasai villages and terrorizes Maasai folk with violence, his appearance of an monster is frightening. While he is tall, ugly and green, making him look inhumane, he has three eyes suggesting that he is larger than human life. Perhaps his three eyes represent an embodiment of male tendencies of greed, desire and territorial impulses. 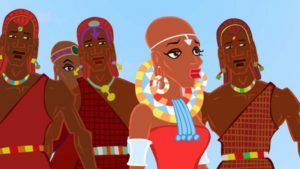 The ogre becomes infatuated with a Maasai woman picking berries and transforms into a handsom man, kidnaps her, forces her to be his girlfriend and makes her promise not to tell her village about him before releases her. The fruit she is picking when the ogre kidnaps her conveys symbols of her fertility to the viewer. The scene of the ogre capturing her is shown between other scenes of him capturing livestock: the director drawing a parallel between the woman and livestock as territory for men to fight over. When the Maasai people decide to fight the ogre, they use her as bait to lure him out of the mountains and then push her aside to fight him, portraying how women are as objects or in this case, bait. The director, Kwame Nyong’o, conveys the animalistic nature of men through an exaggerated character of the ogre. By turning this film into a creation story of the mountains that backdrop the capital of Kenya, he is making a larger statement regarding underlying gender roles that are ingrained in Kenyan society. Nyong’o, Kwame. “Biography.” IMDb, IMDb.com, www.imdb.com/name/nm6444641/bio? ref_=nm_ov_bio_sm. Nyong’o, Kwame. Kwamenyongo – Portfolio, www.kwamenyongo.com/portfolio.html.